Was it Mark Twain who supposedly said he was happy if he looked in the obituary each morning and didn’t see his name? I’m not sure. I must not have Googled on the correct words, and I probably got the exact quote wrong. I don’t read newspapers–foxnews.com normally tells me what I need to know about the sad state of the world–and I wouldn’t read the obituary column even if I read newspapers. I’m not that morbid. Even though I’d rather know for sure that I’ll die in my sleep when the time comes, I’m not afraid of death itself. Jesus’ death and resurrection removed that concern. 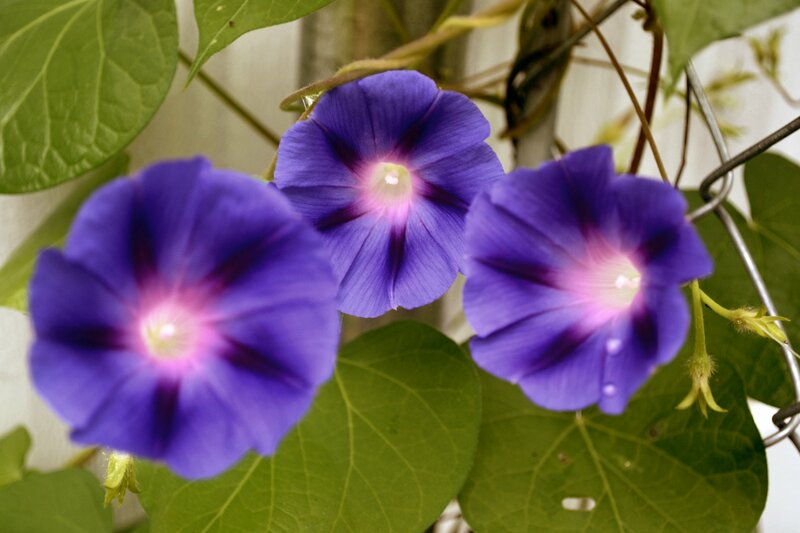 Now to the topic of morning glories. When I go outside every morning, I may or may not see sunshine. 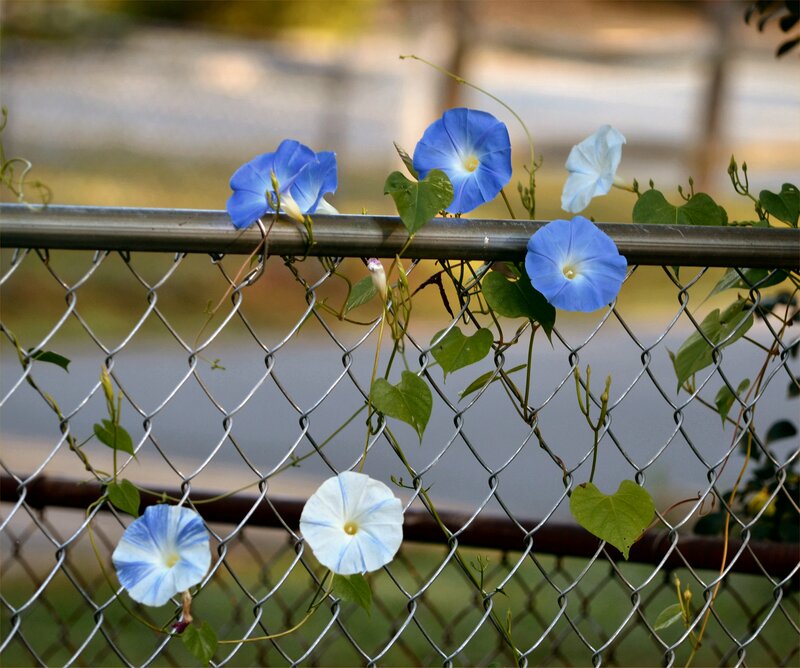 But- during the summertime – I can count on seeing fresh morning glories blooming everywhere and the ugly remains of the previous day’s blossoms dying off. 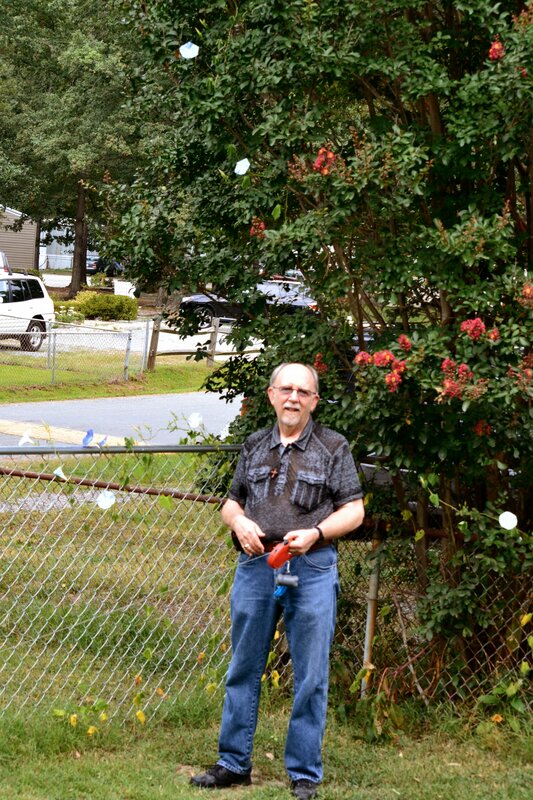 The picture on the far right is of me standing in front of our next-door-neighbor’s crape myrtle. One of our morning glory vines hand has grown up from the fence into the tree branches. Probably a good three-to-five feet higher than my 5’6″. (Click on the thumbnail for a larger picture.) 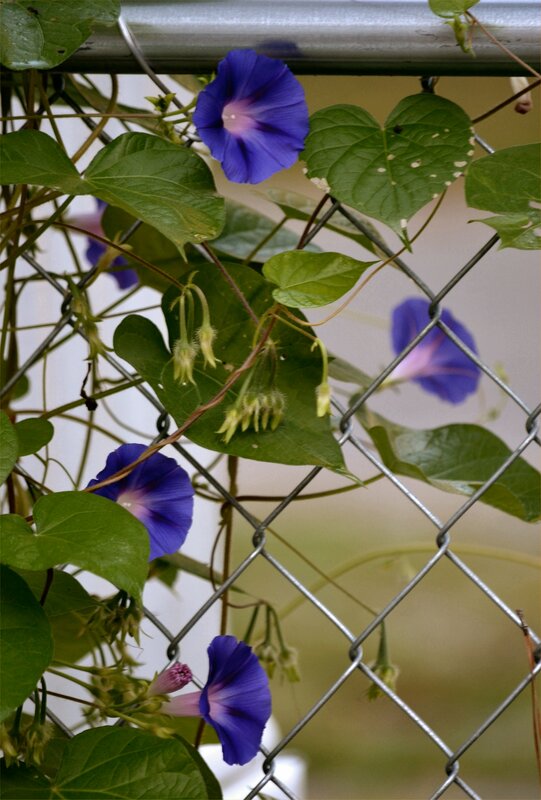 The other pictures are of morning glories whose vines are still on the fence. The ability of morning glories to reseed (maybe not the proper botanical term) from year to year, even though they’re not perennials, fascinates me. Also the subtle differences among the blooms. Morning glories make me think about life and death. Over the course of mankind’s existence, everyone has eventually died and babies have been born to take their place. That’s one way to look at morning glories symbolically. But I prefer another viewpoint. Each bloom has an appointed lifespan, just as each of us does. None of us knows what ours will be. But for Christians, secure in their belief in the resurrection of Jesus Christ, the bloom dying on the vine might symbolize earthly death. The dead blossoms will never become alive and beautiful again. I’d like to picture our entry into Heaven as being like a dead blossom being reborn as an immensely more beautiful morning glory than it had been here on earth. Something that doesn’t happen with real morning glories. This entry was posted in Blooms, Blossoms, Heaven, Morning Glories, Uncategorized and tagged As I Come Singing, Christianity, Heaven, Morning Glories, On Aging Gracelessly, Roger E. Bruner. Bookmark the permalink.